Heirloom bulbs are a great investment in the perennial garden. They will provide years of color in return for the small amount of money and time spent planting them, and their beauty will happily increase as clumps mature and their numbers multiply. Many bulbs have a specific season of bloom color. After their blooms have finished, some bulbs, like crinums and iris, will have foliage that persists and looks attractive for much of the year. The foliage of other bulbs will live just long enough to store energy for next year’s bloom. After that, their foliage will fade away and the bulbs will rest. When bulbs are not blooming, or when they are completely dormant, we count on perennials to take up the slack. Perennials and bulbs are perfect companions. Depending on your selections, some combinations may bloom at the same time. In other cases, perennials will take over where the bulbs leave off. When planting bulbs and perennials together, keep in mind that most bulbs and some perennials will need to be divided every few years. Regular pruning will keep clumping or spreading perennials from taking over the space allotted to the bulbs. Perennials and bulbs each need their own share of nutrition, so add compost or Arbor Gate Organic Soil Complete to the soil before planting and fertilize with Arbor Gate Organic Blend. Regular applications of fertilizer will provide the nutrients needed. Water when rainfall is not sufficient, paying more attention to this during the heat and drought of summer. Aquilegia chrysantha ‘Hinckley’ – Hinckley Columbine – A gorgeous evergreen native Texas perennial for shade gardens. Forms 24” mounds of bright green parsley-like foliage all winter. Then in March-April, produces stalks of magnificent orchid-like yellow flowers for up to 6 weeks! Afternoon shade & good drainage. Aristolochia fimbriata – Fimbriata Dutchman’s Pipe – A smaller version of Dutchman’s Pipe with 2” – 3” rounded green leaves that have a light-green pattern on the surface. It blooms in cycles from spring to fall in miniature burgundy & yellow flowers. It grows mainly as a groundcover. Host plant for the Pipevine Swallowtail Butterfly. Moist, well-drained soil. 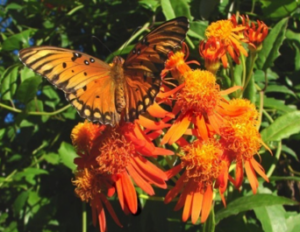 This plant is a MUST for any butterfly garden. Aristolochia watsonii – Southwestern Pipevine – An extremely rare, trailing dutchman’s pipe vine native to Arizona. The 1” long, arrow-shaped leaves are usually dark brownish-green when growing in full sun, lighter green in less sun. The tubular funnel form flowers are about 1.5” long, green with brown spotting. An important host plant for the pipevine swallowtail butterfly. May prefer a bit of afternoon shade – needs a well draining soil. Will not tolerate wet feet. For this reason, watsonii is an excellent plant for containers – an unusual and unique trailing accent. Bouvardia ternifolia – Scarlet Bouvardia – This lovely Texas native blooms from May to November . Bright reddish, orange flower clusters cover this plant and attract butterflies and hummingbirds galore! Dead head regularly to keep it dense and neat. Good drainage – partial sun to full sun. Root hardy most winters. Grows 2’ x 2’. Excellent cut flower. Calamintha georgiana – Georgia Savory – A small, compact, evergreen shrub with wonderfully scented, tiny, glossy, dark green foliage. It is covered with attractive, small pink flowers in late summer and fall. For all its wonderful attributes, the Southeastern U.S. native is also very drought tolerant and it attracts hummingbirds & butterflies! It grows in full sun or light shade in well-drained soils. Extremely cold tolerant as well. Callicarpa japonica – ‘Snow Storm’ Beautyberry – A dramatic addition to the beautyberry family – it has stunning white-cream-green variegated foliage, clusters of pink flowers in the summer and loads of rose-purple berries in the fall. ‘Snow Storm’ forms a nice compact shrub mounding to 4’x3’. Prefers light shade and a moist, well-drained soil. Deciduous. Beautyberries are a food source for up to 40 species of birds. Cassia corymbosa – Flowering Senna – A showy, evergreen large shrub or small ‘tree’ that puts on a spectacular display of large, round clusters of yellow flowers summer & fall. Grows anywhere from 6’ to 12’ tall. Tolerates occasional drought & flood conditions. Sun. Cuphea ignea ‘David Verity’ – David Verity Cuphea – A compact and more refined version of the standard cigar plant. ‘David Verity’ grows into an upright, very full plant with tiny foliage and it is a non-stop bloomer of small, tubular, orange and yellow flowers spring through fall. It’s an incredibly tough plant and doesn’t seem to have any insect or disease problems. It’s a great companion plant for the Mexican Butterfly Weed. Averages 3’ tall. Sun, light shade. Hummingbirds & Butterflies. Dichondra sp. – Silver Pony Foot – A normally evergreen, ground-hugging groundcover with small, rounded, shiny silver foliage. It slowly carpets the ground wherever it’s planted provided the area is well-drained. Beautiful cascading over walls, rock, or containers. Sun, light shade & well-drained. Eutrochium maculatum – Spotted Joe Pye Weed – Spotted Joe Pye Weed is an erect clump-forming perennial that grows 4’-5’tall. In mid to late summer it explodes with large bright mauve-pink flower clusters on deep wine red stems. The flowers give way to attractive seed heads which add interest to winter gardens. Sun or part shade and moist, well-drained soil. Butterflies! Fern – Adiantum capillus-veneris – Southern Maidenhair Fern – A delicate looking, elegant, native Texas Fern with its fine textured foliage and black stems. It forms attractive 18” clumps of bright green foliage throughout the warm seasons, then goes dormant after the first hard freeze. Needs shade and a moist, well-drained soil. Fern – Pteris ensiformis ‘Evergemiensis’ – Variegated Brake Fern – This remarkable fern with its beautiful variegated cream and green fronds is quite hardy. It will grow in moist locations, but is extremely tolerant of drier soils as well. Plant where it can get filtered sunlight. Has been root hardy in our gardens here at Treesearch for many years. 12’’-16’’ tall. Ficus tikoua – Sandi-Leaf Fig Ivy – Not the classic fig ivy – this one is a tough, bold, coarsely textured ground cover for sun or part shade. Medium green, 3”-5” oval shaped leaves have a marvelous sandpaper texture. Self-layering, carpets an area fairly rapidly. Produces small “figlets” that birds might enjoy. Normally evergreen in Houston. Comes back from hard freezes. Globba winitii ‘Grandiflora’ – Giant Pink Dancing Lady Ginger – This stunning addition to the Dancing Ladies family produces a much showier bloom than its delicate sister. 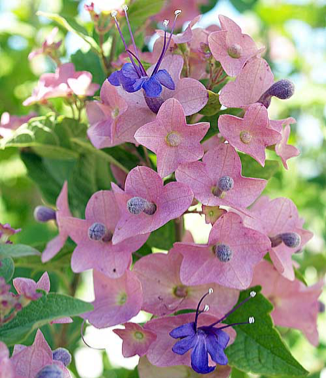 She produces long, gracefully arching panicles of pink bracts and tiny yellow flowers that seem to dance in the air! The bracts start out white and turn to a rich dark pink. They bloom all through the summer into fall. Grows 2’ tall with long, lance shaped leaves on short stems. Will go dormant in winter and reappear each spring. Part shade to shade. Moist, well-drained soil. x Gordlinia grandiflora – Gordlinia – An exciting but seemingly unlikely combination, this inter-generic hybrid tree combines the hardiness of Franklinia with the cultural ease of Gordonia. Early, white 2” flowers, semi-evergreen foliage, and a robust tree-like growth habit make this an exciting new flowering tree addition to the trade. Over time could reach 30’ tall and half as wide. Picks up nice red and orange colors in the fall. As both parents are from the Southeast, good heat tolerance as well. Hibiscus cardiophyllus – Heartleaf Hibiscus – A unique & absolutely delightful hibiscus native to South Texas and Mexico. This small, drought-tolerant 2’ – 3’ hibiscus has wonderful, velvety soft, heart-shaped leaves & is a non-stop bloomer with gorgeous 2” – 3” rich coral-red flowers from mid-spring to the first freeze. It must have good drainage and full sun. Butterflies!! Holmskioldia tettensis – Chinese Hat – What a wonderful color combination in the flowers, blue & pink! Each unique Chinese hat-shaped flower is made up of a blue, butterfly-shaped flower ringed by a flat, pink, scalloped, circular calyx. These ½” flowers appear in dense terminal clusters throughout summer & fall on an upright large 4’ shrub or can grow into a small 8’ “tree”. Deciduous & root hardy in colder winters. Sun, light shade & a moist, well-drained soil. Butterflies. Iresine herbstii – Purple Lady Iresine – A spreading ground cover with colorful dark burgundy foliage. Heat tolerant – grows best in shade or partial sun. Low maintenance. Root hardy in mild winters. Justicia spicigera – Mexican Honeysuckle – A tough & wonderful shrubby perennial with a 3’ – 4’ full, rounded form of velvety-green leaves. 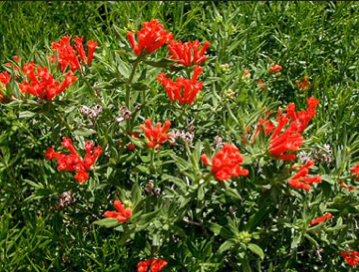 It’s covered with clusters of 1-1/2” bright orange, tubular flowers all during our warm months. It’s drought tolerant once established. Sun or light shade. Hummingbirds & Butterflies. Lespedeza liukiuensis ‘Little Volcano’ – Little Volcano Lespedeza – A graceful, deciduous shrub that erupts with bright rosy wine flowers in the fall (and normally a surprise bloom cycle in the spring). Upright, clumping branches are covered with small, dark green leaves. Forms a mound 8’ tall by 8’ wide or bigger, depending on how far back you cut them in the spring. Sun. Well-drained soil. Lobelia siphilitica – Blue Cardinal Flower – A native perennial which typically grows in moist to wet locations. Clump-forming. Features light to dark blue, tubular, 2-lipped flowers. Late summer into September bloom time. Likes rich, humusy soil and partial sun to shade. Malphighia glabra ‘Nana’ – Dwarf Barbados Cherry – Unique & colorful native shrub with pink & white flowers summer & fall, & then producing an abundance of red, cherry-like fruit! Evergreen most winters. The dwarf variety averages 3’-4’. Sun, part shade. Birds! 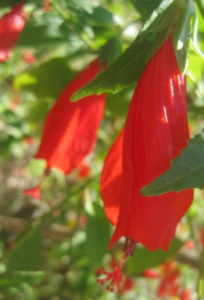 Malvaviscus arboreus v. drummondii – Red Native Turks Cap – A tough, non-stop blooming perennial shrub that produces red flowers almost all spring, summer, & fall in heavy blooms cycles. It also produces interesting red seed pods normally in fall. Sun or part shade. Hummingbirds & birds! Also comes in a pure white form. It responds well to pruning for a fuller looking plant. Beautiful in mass plantings, especially red & white together. Malvaviscus arboreus – Giant Red Turk’s Cap – This native perennial shrub of Mexico & Texas makes a spectacular fall statement in any garden with its showy display of large, partially opened 2”-3” vivid red flowers. It’s an absolute magnet for hummingbirds, &, many bird species enjoy dining on the attractive red fruit. Giant Turk’s Cap forms a large 5′-6′ shrub or can be trained into a 6′-8′ tree form. It is an extremely tough & versatile plant & will grow in sun or part shade. It’s drought tolerant, yet will tolerate wet, & will perform in a wide variety of soils. Will bloom throughout a mild winter but goes dormant in a hard winter. Mascagnia macroptera – Mexican Butterfly Vine – A semi-evergreen sun loving vine that’s covered with clusters of fabulous bright yellow, orchid-like flowers summer thru fall!!! After a bloom cycle, the flowers are followed by interesting butterfly-shaped chartreuse seed -pods. Once established, this is one tough, beautiful, long-lived vine. Sun. Moist, well drained soil. Megaskepasma erythrochlamys – Brazilian Red Cloak – A stunning, super showy, root hardy tropical shrub from South America that grows into a large 10’–12’ lush plant with large, glossy leaves & unbelievable 12”-18” panicles of bright red bracts & white flowers late summer & all fall. An incredible showstopper as a featured plant at the back of any garden! Butterflies! Sun & a moist, well-drained bed. Pavonia lasiopetala – Dark Pink Rock Rose – An outstanding sun-loving, drought-tolerant, evergreen mounding native perennial that’s almost constantly blooming 2” dark, hot pink flowers spring to fall. Attractive, dark green, small arrow-shaped foliage. Sun & well-drained soil. Forms a 2’-3’ mound and responds well to pruning. Butterflies! Phlox paniculata ‘John Fanick’ – John Fanick Phlox – One of the finest summer phlox for the south!! It is not only an outstanding bloomer, but is tight and compact for a summer phlox, is mildew resistant, & it is very heat-tolerant – must be, it was found in San Antonio!! 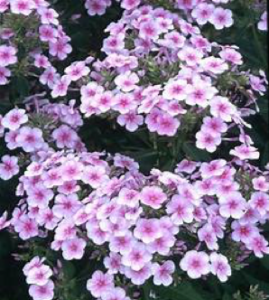 Produces huge heads of light pink flowers with a dark pink eye from May to September. 24” – 36” tall. Sun or light shade. Podranea ricasoliana – Desert Trumpet Vine – Fast growing, root hardy vine that is evergreen in mild climates. Grows to 20’ high. Covered with 3” open, trumpet-shaped pink flowers, veined in red, late summer and fall. 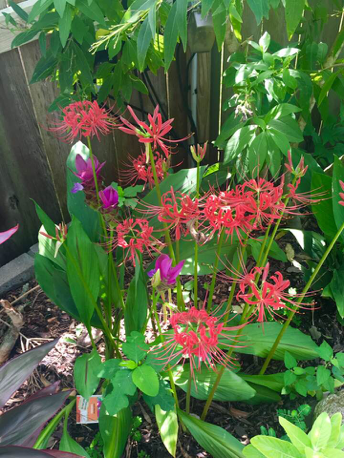 Blooms in loose clusters at the ends of new growth. It likes heat, full sun, good drainage. Hummingbirds! Prunus mexicana – Mexican Plum – Outstanding native spring blooming tree with very fragrant white flowers! Slowly grows to about 20’. Sun, part shade. Produces a tasty small plum. Great for eating, for jellies, jams, & for sharing with the birds! Butterfly nectar & host plant. Prunus sp. ‘Hirome’ – Dwarf Hirome Cherry – A dwarf flowering & producing cherry grown as a 3’ – 4’ shrub. In very early spring, every stem is covered with pink flowers & later in the year it produces ½” red cherries that are tart but edible. The fruit is also very ornamental & is a great bird attractor. Full sun to light shade and moist, well-drained soil. Rosa sp. ‘Ducher’ – Ducher Rose – Ducher has petals that drop cleanly from mid-sized ivory-colored flowers. Categorized as a china-type, released in 1869. Ducher has double white flowers that bloom spring, summer, and fall. Fragrant, disease resistant, 3 or 4 feet tall, by 2 or 3 feet wide and good for containers. Treesearch Signature Plant. Salvia nemorosa ‘May Night’ – ‘May Night’ Salvia – An outstanding salvia with a compact growth habit, profuse deep purple flower spikes and a tolerance for heavy clay soils. Foliage is evergreen in winter – very cold hardy! Blooms nearly year round. Dead head occasionally. 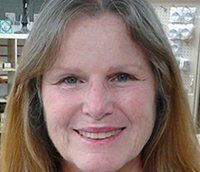 Bees, butterflies and hummingbirds love ‘May Night’. Deer and rabbit resistant. 12’’-16’’ high including the flower spikes. Full sun to partial sun. Senecio confuses – Mexican Flame Vine – A fast growing, extremely showy vine with wonderful glossy, bright green foliage and 1”, bright orange daisy-like flowers that blanket the vine all summer and fall. Needs moist, well-drained soil. Normally root hardy. Full sun. Butterflies! Stemodia tomentosa – Wooly Stemodia – This tough little Texas native is a fast growing, mat-forming groundcover with soft, silver-gray foliage and small purple flowers from spring through frost. Takes heat and humidity well, and is easy to keep in bounds. Can also be used to spill out of the edge of containers. Requires good drainage. Talinum paniculatum variegatum – Variegated Jewels of Opar – A standout in any garden – Variegated Jewels of Opar has creamy white edged thick foliage set off by wiry reddish stems topped with dainty pink flowers. Grow in well-drained soil, sun to partial sun. Has been root hardy in the landscape in Houston. Great in containers too. Tradescantia sillamontana – White Velvet Spiderwort – A stunning & unusual groundcover perennial with iridescent, velvety, silver-gray-green foliage with a hint of rose & purple. An added bonus are the almost constantly blooming small violet flowers! Grows about 3″-4″ tall. Root hardy. Sun, light shade & a moist, well drained soil. Turnera sp. – Creeping Yellow Turnera – Buttery yellow blooms cover this groundcover form of turnera nearly all year long. Flowers will open in the morning and close before dusk to be replaced in abundance the next morning. Can take full or partial sun. Well-drained soil. Stays 10” or lower. Evergreen in mild winters. Butterflies! Viguiera stenoloba – Skeleton Leaf Golden Eye – Tough Texas native makes a mound of deep-yellow daisies that stay in flower spring through late fall. Slender needle-like leaves give it a delicate look but this is an extremely drought tolerant perennial. Grows 2’ tall, cut in half once a year to promote denser growth and more flowers. Full sun, needs good drainage. Butterflies! !